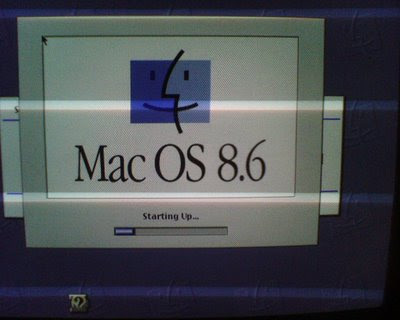 I just booted up my old PowerMac 7300/180. Then all the extensions started marching across the bottom of the screen... then OneClick loaded... Whoa! Now I find myself constantly trying to right-click on a one button mouse. Ugh. The purpose of this is to salvage my data on here for backups. I'll probably keep the mac somewhere as it's the only thing I have right now that will read any of my old SCSI drives that are Mac formatted. In the meantime I've also cleaned up two older PC's for recycling. I cleaned the drives off with DBAN and then installed a small linux distro. I've used both Puppy Linux and Damn Small Linux. For some reason I couldn't get Puppy to boot off the hard drive on the old AMD K6 (It was suggested that I needed a "K9" for that) but I got DSL to install just fine... and it's fast too. I'm impressed how these tiny distributions identify all the hardware and just work... even with my unknown 10T ethernet cards that I once bought for $5 off eBay. These are old but they boot, find the internet and find google. I wouldn't try to watch YouTube with these but they might be good for someone.